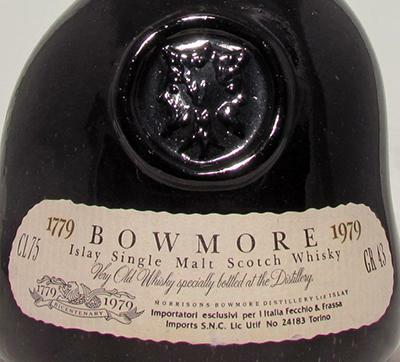 Note from a member of The Scots Whisky Forum: Bowmore celebrated his bicentenary in 1979 and released a large number of bottlings (to be found in Hans Sommer, the Dutchman who sold his distillery collection). There was, among other things, the Bicentenary in the crooked bottle (a replica of the earlier hand-blown bottles for special bottlings). Keyword slate neck, red wax closure. Packaging in heavy wooden box, or black cardboard box, or nice wooden box (I believe for Japan), certificate of authenticity on handmade paper with signature of Morrison, wrapping paper, cork and letter of the still. Inside the pulley is a long cork labeled Bowmore Bicentenary, which is guaranteed not to come out at once, so crumbs are preprogrammed. Of these, there were 24,000 pieces. Of these, the normal one was filled with the Lion Halslabel with the years 1950 to 1966 (in the worst case, "only" 12 years old). Everyone is allowed to figure out for themselves how the distribution of the vintages looked. In any case, there can not have been a "solera procedure" in which everything was poured together and then allowed to lie again. I've tried the normal 10 times and everyone tasted different (thanks Mara). Not all were really good. So far we are talking about 20,400 bottles. 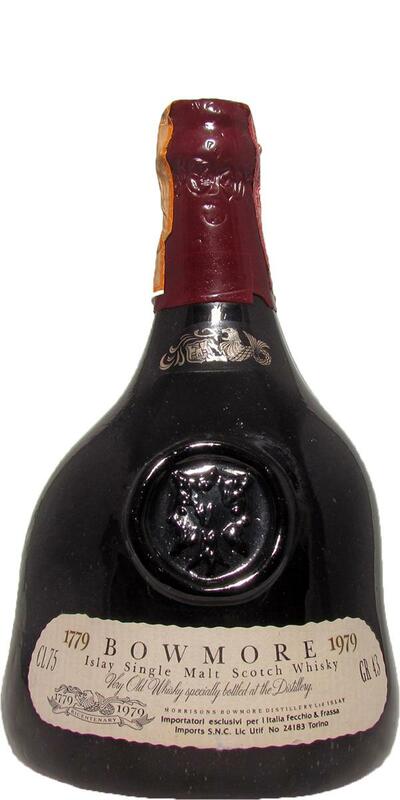 In the 3600 remaining bottles we speak of a Bowmore distilled in 1964 and after at least 14 years 1979 in the bottle of the same design came, just with the neck label 1964, instead of the Lion. This Bowmore is for me one of the best I know. I remember blackcurrant, which is not as sweet as the '66s.